Thailand Centre of Excellent for Life Sciences (TCELS) was established as a public organization under supervision of the Ministry of Science and Technology. TCELS has crucial mission assigned by the government to increase development and impulse the life science business and industries in Thailand concerning for health. Its mission also focuses on promoting Thailand to become well-known and widely accepted in life science area. National Astronomical Research Institute of Thailand (Public Organization) (NARIT) is a research institute under the Ministry of Science and Technology (MOST) Thailand. It carries out an ambitious programme on playing a leading role in promoting and organizing cooperation in astronomical research throughout Thailand and South-East Asia. 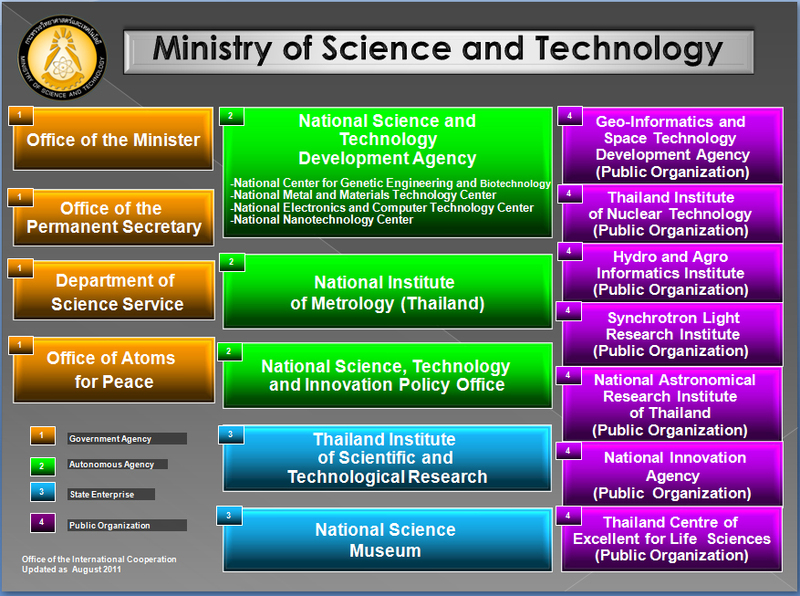 The National Innovation Agency (NIA) was established by the Ministry of Science and Technology on October 1, 2003. Since its inception up to September 1, 2009, NIA operated as an autonomous agency, under the supervision and policy guidance of the National Innovation Board, but outside the normal framework of the civil service and state enterprise. From September 2, 2009 onwards, NIA was restructured and became a Public Organization, while remaining under the umbrella of the Ministry of Science and Technology. Hydro and Agro Informatics Institute (Public Organization) or HAII is a public organization under the Ministry of Science and Technology with main responsibilities in developing and applying science and technology to support better agricultural and water resource management. 75/47, Phrachomklao Building, Ministry of Science and Technology, RAMA 6 road, Thung-Phyathai, Ratchathewee, Bangkok 10400. 75/47, Ministry of Science and Technology, RAMA 6 road, Thung-Phyathai, Ratchathewee, Bangkok 10400.